The Camelidae family consists of a small family of mammalian animals. There are two members of Old World camels living in Africa and Asia which are the Arabian and the Bactrian. Four members of the New World camels living in South America are the llamas, vicunas, alpacas and guanacos. The Camelidae evolved in North America. Their early ancestors migrated from North America.They came here by crossing the Alaskan land bridge to Asia and the Panama land connection to South America. Then over time they eventually became extinct in North America, but began to adapt in their new lands. Once they had crossed into Africa, they were found across the entire northern region. Camelids are all fairly large. The South American range in weight from 35kg to about 100 kg. Old World camels are much larger and they weigh from 450kg to even 650kg. Camelids vary in body shape, but they all have a small head and a long neck. They have long legs that, because they lack tensor skin to bridge between their thigh and body, they look even longer. Even though it may look like they have hooves, they do not; instead they have a two-toed foot with toenails and a soft footpad. Camelids are sometimes grouped with several extinct families that had "padded feet", like in the infraorder Tylopoda. Camelids have a three-chambered digestive tract and an upper lip that is split in two with each part separately moveable. They have elliptical red blood cells which is unique among mammals. Camelids reproduce sexually. Mating season for the Camelidae occurs in the fall. During mating season, males are often violent and they may try to spit on, bite, or even sit on other male camels. Sexual maturity does not always come at the same time for these animals, but for most, it arrives between the ages of three and five. Pregnancy normally lasts thirteen months. Most young are born from March through April. One calf is normally produced, but occasionally they will have two calves at a time. Every other year females can give birth to a new calf. The baby calf has the ability to stand at birth and walk only a few hours after. The young calf stays with its mother for three to five years, until it reaches sexual maturity. Not all camels require three to five years to mature though. 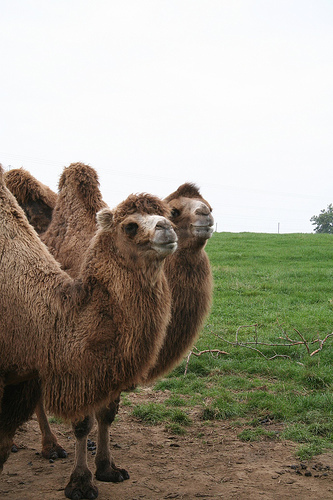 Young bactrian camels for example, are able to stand and run soon after birth. They are nursed for about 1.5 years in the wild and are fully grown by 5 years of age. Camels are herbivores. They are able to eat plants that are dry, prickly, salty, and/or bitter, but they would rather have any kind of vegetation. When other nutrient sources are not available, these camels may feed on bones, other animals' skin, or different kinds of flesh. The first time food is swallowed it is not fully chewed. The partly masticated food (called cud) goes into the stomach and later is brought back up for further chewing. When most people look at camels they think that they store their water in their humps. The humps are not their means of water storage though. In fact they contain a large amount of fat and are use for nourishment when food is scarce so camels can go many days without eating anything new. Each hump can hold up to 36 kg of fat. The hump decreases in size and become flabby as its contents are metabolized. They are usually found along rivers in the Siberian steppe during winter but when Spring comes they move to the desert. Temperatures range from -29 degrees Celsius in the winter to 38 degrees Celsius in the summer. Not all camels like to live in the same place though. The South American members of the family for example, choose to live in the cool, dry mountain areas of that continent all year round. This page was last modified on 24 July 2014, at 15:57.